On the 25th April 2012 the Garden History Society and the London Parks & Gardens Trust held a Study Day on the subject of the garden at Sayes Court, John Evelyn’s 17th-century house adjoining the historic naval dockyard in Deptford. Apart from the garden’s intrinsic interest and importance, the immediate stimulus for the day was a local campaign, led by landscape architect Roo Angell and architectural designer Bob Bagley, to save the site of the demolished house and part of the garden from obliteration by a proposed development, partly high-rise, known as Convoys Wharf, to be built by the Hong Kong-based developers Hutchison Whampoa on the now derelict dockyard, which dates back to the reign of Henry VIII. After a morning of lectures we arrived at Greenwich from central London by boat, first visiting the small public Sayes Court Park in Deptford, the only open space remaining from Evelyn’s garden, originally part of his grove. Refreshments at the Master Shipwright’s House were followed by a summary and discussion of the day’s events, with both speakers and participants expressing strong support for the campaign. The purpose of this note is to inform those interested about developments since then. Present at the study day was Jon Wright of the Council for British Archaeology, which then applied to the World Monuments Fund for listing of the dockyard with the garden and house site as endangered. In addition, Roo and Bob approached the National Trust for support, as a previous attempt to preserve the house and garden in the 19th century had been instrumental to its foundation. In July 2012 they held talks with the NT, who together with the London Borough of Lewisham have expressed keen interest in investigating the potential for a John Evelyn centre for horticultural education on the site of the house, with a garden linking it to the existing park. In October 2013 they heard that the WMF had put the whole site on their Watch List for 2014, thus giving strong support to the Sayes Court project. Although it is agreed on all sides that the site needs development, Lewisham Council have throughout had a number of concerns, including the failure to consider the design in the light of the history of both the dockyard and Evelyn’s house and garden. They are therefore fully supportive of Roo and Bob’s project. They are now considering a third master plan for the dockyard site, from Terry Farrell and Partners. This takes greater account than earlier plans of the original layout of the dockyard and surviving listed buildings, together with the results of extensive archaeological investigation, some of which will remain exposed. 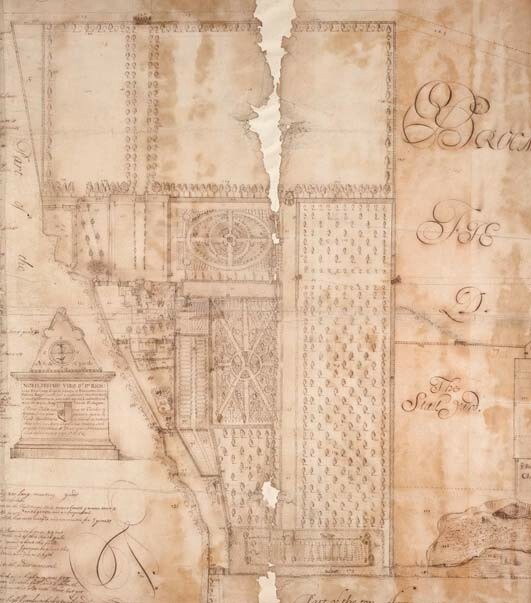 It includes the provision of accommodation for a John Evelyn centre and the display of an excavated portion of his house within a larger block, but not the planned garden linking the house site to Sayes Court Park. It is envisaged that the centre would provide education facilities for young gardeners, and there is a view that a garden is essential from a practical as well as a historical point of view. It would not, however, be a replica of any part of Evelyn’s plan, but a modern design reflecting aspects of it. The services of David Kohn Architects have been secured and the designer Dan Pearson (Dan Pearson Studio) has also had input. While welcoming the improvements made in the latest master plan, both Lewisham and English Heritage still have concerns. As it has not proved possible to reach agreement, Hutchison Whampoa have asked the GLA to take over as the local planning authority determining the application. This has been agreed, and the decision will be made very shortly (the GHS and LPGT have submitted their views jointly). In a recent House of Commons debate, Minister Ed Vaizey responded positively to the eloquent arguments of Dame Joan Rudock, MP for Lewisham, in favour of the amendments required, including the implementation of Roo and Bob’s plans for the John Evelyn centre and garden. No doubt, to be continued . . .